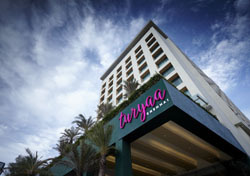 Turyaa Chennai, owned and operated by Aitken Spence Hotels, successfully met the criteria for obtaining ‘5-Star Deluxe’ classification, ranking it as one of five hotels in Chennai to have obtained this accreditation. Turyaa Chennai joins Hilton Chennai, Hyatt Regency Chennai, ITC Grand Chola Chennai and Park Hyatt Chennai in the ‘5-Star Deluxe’ category segment. The 140-room property situated in the IT corridor of Chennai, minutes away from the bustling city centre, is recognised as one of the best new hotels in the city offering the perfect amalgamation of business and leisure. Aitken Spence Hotels operates a chain of 24 hotels and resorts in Sri Lanka, India, Oman and the Maldives.